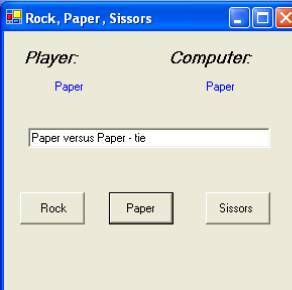 Write the rocks, paper, and scissors game in VB 2010. You should let the user select what they want and then you should have the computer randomly respond. I did a simple example that I am showing you here. I do not want you to have the same look and feel – make yours better. 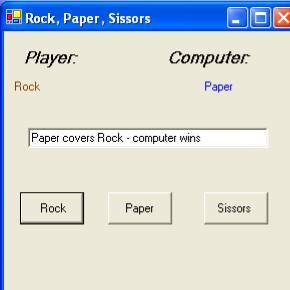 In the first example, the player selected Rock and the computer randomly selected Paper so the computer won. In the second we both had Paper – a tie. 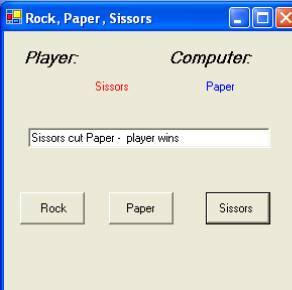 In the third, the player selected Scissors and the computer randomly selected Paper so the player won.